Clear aligners have a lot of advantages over metal braces—most obviously, they're clear and they're removable. There is a tradeoff, though. Because they aren't attached to the teeth, some movements can be more difficult to acheive than they are with traditional braces. 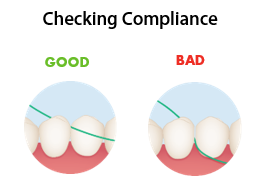 For this reason, it’s important for you to know the limitations of clear aligners so that you can properly assess whether they can achieve the treatment outcomes that you and your patient desire. There are two key principles to keep in mind. Principle 1: Teeth need space to move. When you prescribe your case, you can plan to create space with extraction, arch expansion, or IPR, depending on how much space is required. However, despite prediction and planning, there may be some instances where insufficient space will still be an issue. For example, when teeth crowd each other there may be tight contacts between them. Tight contacts between teeth are common and exist naturally due to the patient's dentition. The teeth are so crowded, they press up against each other, and literally put each other under pressure. You can try to relieve this pressure by creating space (for instance, by performing IPR). If there's enough pressure, the surrounding teeth may just move in to fill the space you’ve created. If this happens, you may need to create more space than originally intended. If this is not caught and addressed, it can prevent treatment from going forward as planned because the rest of the movements no longer have sufficient space to straighten out. This can result in treatment going off track and the aligners no longer fitting. Conversely, you don't want too much space left between the teeth. Compliance Checkpoints can also help you to tell if the space you made is closing as planned. TIP: Always track the amount of IPR being done. We offer an IPR tracking chart for this purpose. Principle 2: Teeth need pressure to move. We hope this article helps you to achieve your desired treatment outcomes. For further education on our techniques and solutions, visit our Help Center. If you missed any of our previous tech tips, we post them regularly to our blog, which you can find here.